The Avro Lancaster bomber, from the RAFs Battle of Britain Memorial Flight (BBMF) doing a fly past around Lincoln Cathedral this morning as part of the RAFs 100th birthday celebrations. From Lincoln, she flew off to Holland to appear at several locations. Quite a weekend planned for the BBMF, Hurricane & Spitfire due over Lincoln tomorrow afternoon, a Dakota on Sunday and this beauty partnered with Hurricane and Spitfire possibly on Monday. During WWII, the returning bombers used Lincoln Cathedral as a landmark; when they saw it, they knew they were home safe. The BBMF is based at RAF Conningsby, some 15 miles SE of Lincoln and it's possible to see quite a collection of old WWII aircraft. Lest we ever forget the sacrifice of all who served. At least you got the front end! Great capture! Absolutely fabulous. One of my favourite aircraft of all time (along with the Vulcan). 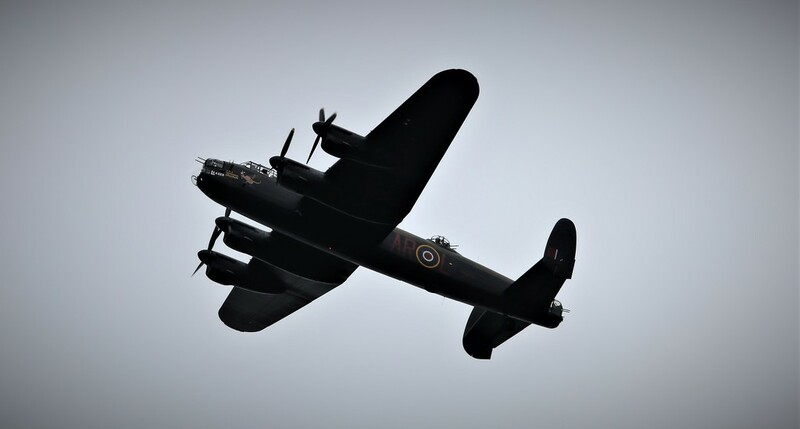 I first saw a Lancaster flying over Hemswell almost 50 years ago. Great catch it works well in B&W I'm hopping to catch them tomorrow. We were at the Shuttleworth collection air display on Sunday and saw this iconic plane. I guess you know the place - a wonderful display if not a little too hot for staring at the skies! !